After all the teasing, Chinese smartphone brand Xiaomi has announced two new smartphones in the Indian market today. 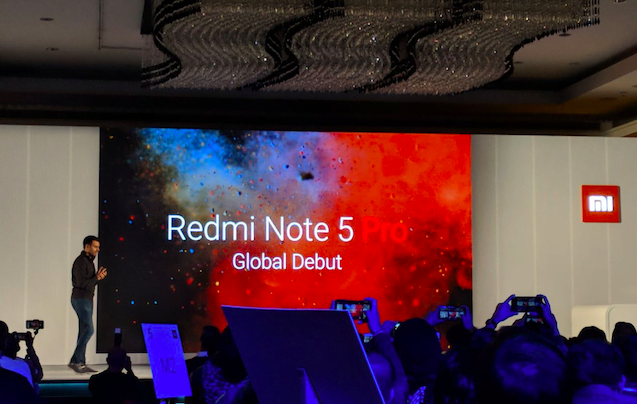 As it rumoured, Xiaomi has launched Redmi Note 5 as a successor to the Redmi Note 4 smartphone and an all-new Redmi Note 5 Pro smartphone to take the budget segment to a whole new level. 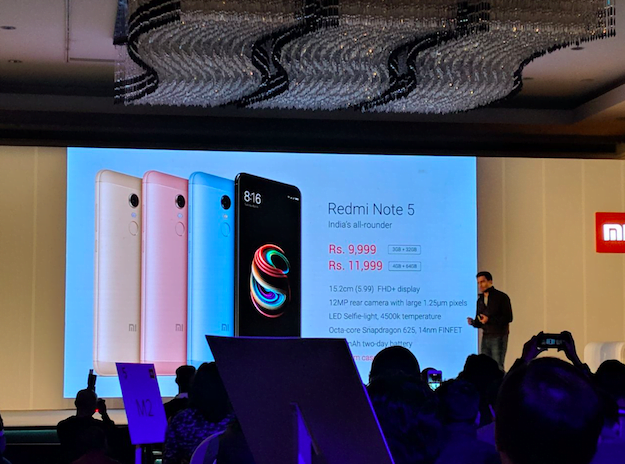 The Redmi Note 5 pricing starts at Rs 9,999 for the 3GB RAM variant, while the Redmi Note 5 Pro price starts at Rs 13,999. Both the smartphones are exclusive to e-commerce portal Flipkart and will be up for sale starting next week. Xiaomi has done a terrible mistake by bringing the Redmi 5 Plus to India as Redmi Note 5 smartphone with the same Snapdragon 625 SoC. At least, the company could have updated the processor to Snapdragon 630 SoC. Nonetheless, the phone replaces the existing Redmi Note 5 in the Indian market. Talking about the specifications, the Redmi Note 5 comes with a 5.99-inch Full HD+ display with small bezels on the top and bottom of the front. The device is powered by the Snapdragon 625 chipset, coupled with 3GB/4GB of RAM and 32GB/64GB of internal storage. Graphics in the device are taken care by Adreno 506 GPU. The Redmi Note 5 features a 12MP rear camera with f/2.2 lens and 1.25 um lens. The rear camera also has support for PDAF, and dual tone LED flash. Up front, we get a 5MP selfie camera with an LED flash support. Both the cameras are capable of recording 1080p videos. The fingerprint scanner is placed on the rear side of the phone, and this entire package is backed a 4000mAh battery. Lastly, the phone boots Android 7.0 Nougat based MIUI 9 out of the box. As stated, the Redmi Note 5 comes in two variants- a 3GB RAM and 32GB storage variant and a 4GB RAM and 64GB storage model. The former costs Rs 9,999 and the latter is priced at Rs 11,999. 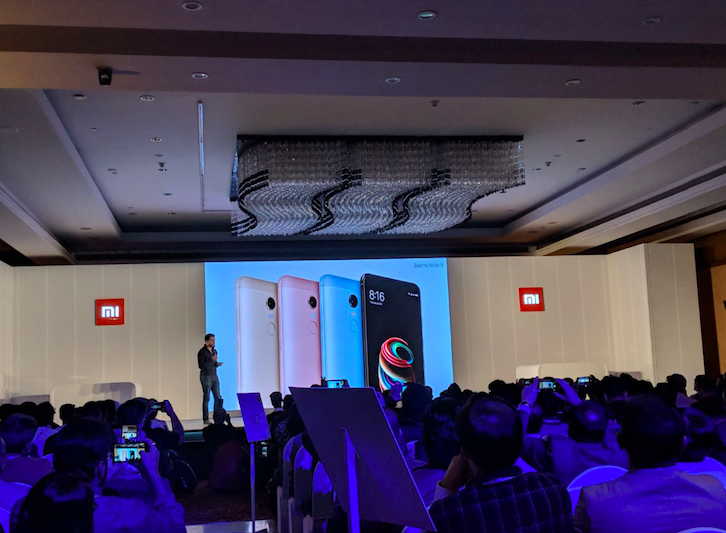 Alongside the Redmi Note 5, the company also brought the Redmi Note 5 Pro device as an India-first device. And they are touting as ‘India’s Camera Beast,’ because it offers dual camera setup at the back. The Redmi Note 5 Pro has a design similar to that of the Apple iPhone X; especially the rear camera module resembles the latter. A 12MP primary sensor is coupled with a 5MP secondary sensor which adds depth information to the phone. Up front, there’s a 20MP selfie camera on the Note 5 Pro. Both the cameras come with an LED flash support. Also, it comes with Electronic Image Stabilisation support. Xiaomi is also offering Face Unlock feature which will be rolled out with an MIUI 9 OTA update by the end of March. The Note 5 Pro is powered by the Qualcomm Snapdragon 636 SoC, and notably, it’s the first smartphone to launch with the said chipset. This device comes in host of storage and RAM models with 3GB of RAM and 32GB storage, 4GB RAM and 64GB storage and a 6GB of RAM and 64GB storage model as well. It boots the same MIUI 9 based on Android Nougat and has a 4000mAh battery backed it as well. The Redmi Note 5 Pro also flaunts a 5.99-inch Full HD+ display, same as the Redmi Note 5. Pricing of the Redmi Note 5 Pro starts at Rs 13,999 for the 4GB RAM and 64GB variant and the 6GB RAM and 64GB internal storage comes with a price tag of Rs 16,999. Did anyone remember, when more then 100 comments for a smartphone topic here on TT??? They don’t call it the budget king for nothing ! This qc 2.0 is equal to the moto turbo charging?